. Tengu to matsu 天狗と松 / 天狗松 the Tengu pine . 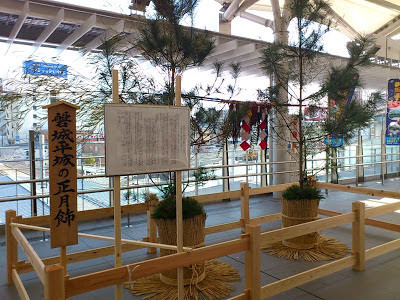 The Pine itself is not connected to any special season, but there are many other words used as kigo, using the pine as a part of it. There also various types of PINE in Japan. First read this essay by Linda Inoki about the pine in Japan. With the onset of winter, many Japanese gardens start to feature strange and ethereal "sculptures" made of string: These are the yukitsuri, or "snow lines." Although their purpose is to protect pine trees from heavy snow, they are so airy and attractive that they seem to invite it to fall from the skies! This practical idea has been turned into a piece of garden artistry, and even in regions where snow rarely falls, gardeners cannot resist adding these graceful touches to the winter scene. 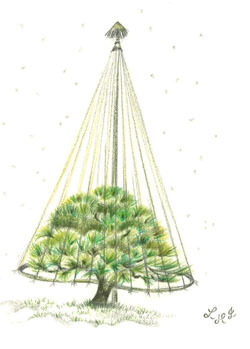 I sketched this small pine tree with its high snow ropes in a Tokyo garden. It is a goyomatsu ( Pinus pentaphylla; Japanese white pine), which you can identify by its silvery bark and pine needles growing in groups of five. White pines are slow-growing and are popular for training into bonsai or specimen trees in the garden. Being tough, long-lived and evergreen, pine trees are important symbols of endurance and eternity in Oriental culture. With their year-round foliage, they also bridge the seasons of winter and spring, and although we live in a material world it is good to see that many people still decorate their gateways with the traditional branches of pine to greet the New Year. They are an auspicious assembly used since olden times in Chinese art, later in Japanese art too. The symbolic meaning of the Pine Tree is "Long Life". Pine trees show abundand green even in the fiercest of winter and hardly dry out, so they have been a symbol of long life in China since old times. They also represent friendship and constancy during times of advertsity. As symbol of good luck and agelessness this tree has stood in veneration and together with the bamboo and plum tree as become an expression of celebration and joy, especialy in the New Year season. Sometimes the pine tree symbolizes one of the Chinese gods of happiness and long life, Shou Hsing.
. . . CLICK here for decorative Photos ! placed one each at the gate or entrance of a home. Their size reflects the richness of the owner. They are put out on December to welcome the Deities and burnt on January 6 or 14 (matsu osame 松納め) . Click HERE to have a look at some more photos ! This hokku is from 1/5 (Feb. 15) in 1804, when Issa was traveling around in the area just east of Edo. His diary states the situation in a headnote. In the 12th month people stood a pair of New Year's pines in buckets or on stands in front of their doors and gates. People with money used taller pines and also added a third crossbar pine so that it connected the tops of the two vertical pines and created a symbolic gate resembling the wood or stone torii gate at the entrance to the precincts of a Shinto shrine. Sometimes a shamanic rope or the horizontal crossbeam above the gate entrance itself served this purpose. In Issa's time many people also put various lengths of bamboo and sometimes other kinds of limbs and flowers in with the pines. 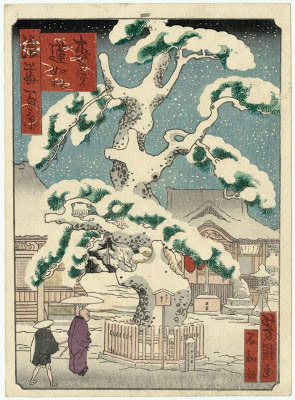 Pine trees were believed to be the tree that gods favored when they came down from the sky/other world, and these "gate pines" were regarded as invitations to the god of the new year (toshigami) to visit the house and bring good fortune to it during the new year. In fact, the shrine-gate shape of the gate pines suggests that they symbolically turned each house into a temporary shrine for the year's god and for other gods. Many people put the pines up on 12/13 and kept them up until 1/15, when they were burned in sacred bonfires under the first full moon of the new year and sent back to the invisible world of the gods. In this hokku it has begun to snow hard, and few people walk through the dim, snowy streets, giving the pines and snow some space and time together. The pines and the falling snow somehow seem aware that they are now together with each other. It doesn't snow that much in the Edo/Tokyo area, so this may be the first time. Perhaps it's a bit like two shy teenagers who like each other and suddenly find themselves next to each other. Of course Issa doesn't know exactly how the pines and snow feel, but there is an uncanny resemblance between descending snow and the descent of various gods of good fortune at New Year's. The pines have been put up above all in order to wait for these gods and to welcome their visits, and now something is happening. Perhaps Issa wonders if the pines can sense gods drifting down in the snow. Or perhaps it's more intimate, since the snow may be falling directly onto the pines, lying on their limbs. This hokku is from the 1st month (February) of 1812, when Issa was staying in the area just east of Edo. It evokes a scene Issa saw at or around New Year's, when people stood a pair of pine trees just outside their doors. One pine was placed on each side of the door, suggesting divine gateposts down which a shamanic god (or a pair of gods) could descend, and at the houses of the rich and powerful a third pine or a string with decorations was often placed horizontally, linking the tops of the two vertical pines, a shape resembling the divine gates or torii at Shinto shrines. Thus the twin pines symbolically made each house or apartment into a temporary small Shinto shrine. Above all, the pines were set up to invite the god of the new year to make a visit to the house and bring good fortune to it during the coming year. However, Edo and the towns around it were filled almost to bursting with poor immigrants from the country -- such as Issa -- who came to Edo to escape difficult conditions, poverty, or even starvation in their farm villages. Most of these people couldn't afford a pair of pine trees 5 or more feet tall, so they bought cheap one-foot sections of a pine limb and stood these vertically on each side of their doors using stands or small pots, often with decorations placed on them. Issa uses the term "short shaku" (equal to 99.4% of a foot) to evoke the commercial nature of these measured and precisely cut sections that poor people had to make do with at New Year's, probably because he wants to stress just how irrelevant physical length is to the spiritual value of the limbs. Issa uses a very polite form for the verb "are" to show his admiration for the people who did what they could and stood the pine limbs in front of their door as an expression of respect for the gods and for all who pass by -- and to show his admiration for the pine limbs themselves, which are just as spiritually imposing at New Year's as the tall pine trees standing in front of the gates of large mansions. The polite verb form suggests Issa isn't writing about his own doorway but is expressing his great respect for the poor family that set up the one-foot pines that in their new context seem so tall. On the 13th day of the 12th lunar month, the pine branches were cut in the local forest and brought home to make the decorations. This was accompanied with music on the way and food afterwards. Nowadays it occurs often on the 8th day of December. In some temples and shrines, ritual dances were also performed on this day. young green, wakamidori 若緑 is a general term for the pines when they start growing. matsu no SHIN can also be interpreted as the strong will of the pine (human) to keep going in adverse situations, so this expression is well loved in Japanese poetry. This is a growing problem in Japan these days.
. Matsutake 松茸 pine mushroom . lit. "insect in waiting", a symbol for a lady waiting for her lover. In the garden, to protect other bulbs and moss. This would give the garden an elegant look. Especially used for tea room gardens. that flourishes and stands godly at Shigeoka, knows no year.
. The Pine Tree Where Yoshitsune Rested . Yoshitsune rested at this location and placed his saddle on the pine tree.
. butai hajime 舞台始（ぶたいはじめ）first stage . Matsu are a favorite for Bonsai too. Look at some nice pictures. MATSU 待つ　can also mean: to wait for somebody. How many have died and returned! ... this verse may be in the form of hokku, but it is not really hokku. It is a religious verse, and when we try to "preach" religion in hokku, the result inevitably fails. Also, this verse requires a kind of prologue just to be understood, which compounds the problem because it cannot "stand on its own feet." Bashô saw a great and very old pine tree at a temple. It reminded him of the story of the Chinese Daoist Zhuangzi (Chuang-tzu) about a tree that survived the years because its wood was useless. That set Bashô off on a train of thought about how many monks had come and gone, like morning glories that bloom in the dawn and die in the evening, and yet the great pine, protected on the temple grounds by the "Dharma," had survived to very old age. Writing about such things has its place, but it does not fit hokku. Hoo no Matsu, nori no matsu, the Pine of the Buddhist Law. 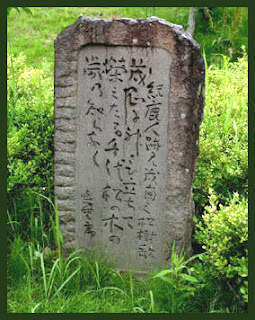 Written in 延宝5年, Basho age 34. In this year, Basho had decided to become a haikai master in Edo. 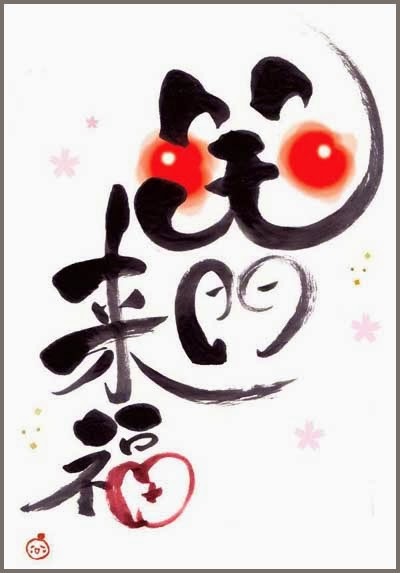 kokorobase is a word play Basho uses to imply himself (Baseo), someone with a sincere heart. How often the frost comes on the pine, the green does not change and stands there in endurance. Read more Haiku here ! This haiku captures the same mood as I experienced in Yonago in 2004. This kigo usually discribes a scene of light and warmth and hope. The following haiku where kindly suggested by Etsuko Yanagibori. to prevent insects to hurt the tree during winter time. - from the series "One Hundred Views of Osaka" (Naniwa hyakkei), 1860. — Museum of Fine Arts, Boston.
. WKD : Memorial Days .
. Honganji 本願寺 Hongan-Ji, Hongwanji .
. Tengu to matsu 天狗と松 the Tengu pine . Kathleen Davis observes, "Pines and mist go together. They have conversations all the time." GOZA 茣蓙 is a thin straw mat used in summer and can be carried around from place to place easily. It is different from TATAMI　畳, which is often also translated as "straw mat", but is much thicker and not easily removable. Pine Pollen Hay Fever, a big problem in Japan ! Fa. Schering has a haiku contest about it. what a big laugh ! The bird builds its next without Issa's knowledge of tomorrow. An image of Buddhist mujoo: impermanence. Matsuo Basho and the "Wild Pine"
His haikai name was Nomatsu An 野松庵 "Hut of the wild pine"
This hokku is from the fifth month (June) of 1815, when Issa was in his hometown and traveling around visiting students in nearby areas. It has been a hot summer day, and one of Issa's shoulders is painfully stiff, perhaps from too much sitting in one position or too much writing or both. At home Issa can no doubt use a soft-headed mallet with a long handle that allows him to lightly hit the muscles in the back side of his shoulder and in the back of his neck, or he can ask his wife to hit the area lightly with her fists, but he is outside catching some cool air, so he no doubt begs a pine tree with a shoulder-high knot sticking out of it to bear with him for a while. He moves his body backwards and forwards so his shoulder softly hits the knot again and again until the stiffness abates or disappears. In this hokku evening coolness refers synesthetically not just to the air temperature but also to the kindness of the pine knot and the looseness of his muscles. 「南無阿弥陀仏。南無阿弥陀仏。」 Namu Amida Butsu, Namu Amida Butsu. Suddenly they saw a light on the horizon, and then one more, and one more. They rowed the boat toward that light in hope for help. The three lights kept flickering as if they wanted to encourage the fishermen to do their best. This light came, in fact, from a pine tree in the compound of the temple. The fishermen rowed faster and faster to reach this light and finally came to the beach. "Thanks to the Buddha from temple Konren-Ji. Let us give thanks and pray!" The fishermen stood in front of the pine and looked up to see the light again, but now all was dark. "This must have been a dragon dancing and thus bringing light to the sea of Masaki!" Eventually years later in a storm this pine tree broke down, but before it died, the fishermen took a branch and planted it anew. And to their surprize the new tree had three main stems. Thus they understood that this pine tree was the dancing dragon. The tree we can see now is a much later generation. This hokku is from early in the first lunar month (February) of 1823, when Issa was living in his hometown. This was the lunar year in which both Issa's wife and his third son would die, but at New Year's Issa shows no signs of being aware of what will happen. Issa's family seems to have been very busy cleaning at the end of the previous year, but apparently they weren't able to finish. Some cleaning continues, and several dirty cleaning cloths have to be washed even at New Year's, so they have to use even the two small pine trees that stand as New Year's decorations on each side of their front door to dry a few of the cloths. These evergreen trees were a prayer for a long life and symbolized the god of the new year (toshi-gami), who was believed to visit the home by coming down the trees. Usually there was a straw rope tied horizontally between the tops of the two pine trees (or sometimes it hung from the horizontal beam above the house door) that created a kind of ritual gate through which people passed whenever they entered or left the house. White paper streamers signifying Shinto spiritual purity usually hung down from the horizontal rope. The pine trees were regarded as the body of the visiting god of the new year, and they were usually burned on lunar 1/15, the last day of New Year's, in order to send off the the god to the other world. We have no way of knowing exactly what the pines and cloths drying by Issa's front door looked like, but it seems likely that a couple of newly washed cleaning rags have been placed on the horizontal rope between the paper streamers to dry. These small cloths, the size of washcloths, were used not for cleaning the body but for wiping floors, tables, and other surfaces, and they had to be washed quite often. The sight of old but newly cleaned wiping cloths drying on the purification rope perhaps seemed appropriate to Issa, since in Shinto everything can become purified by having the right mental attitude. Closer to Issa's core beliefs, perhaps the sudden juxtaposition of clean rags and purification streamers seemed to him to be a momentary vision of the Pure Land in this world. 火消しの松 pine or 火消しのビャクシン A mountain juniper extinguishing a fire. Niryuu no Matsu 二龍の松 Niryu no Matsu, "Pine like two dragons"
Some old trees have a strange demonic power. The pine tree at the temple 参州長興寺 Choko-Ji is called "Pine like two dragons". Once the tree turned into two children, who went to the head priest and asked him for 硯と紙 an inkstone and paper. When he gave it to them, they were much pleased and begun to write a poem on it. "This will prevent any fire from distroying the temple!" they told the priest and then turned back into the two stems of the tree. The paper has become the special treasure and amulet of the temple ever since. Tengu no matsu 天狗の松, Tengu no koshikake matsu 天狗の腰掛松. there was a huge pine tree and from its trunk there grew two こぶ huge bumps. The farmers tried to cut down one of them, but from the cut white mild begun to flow. Since then the villagers let the tree grow and venerated it as a shinboku 神木 sacred tree. During the typhoon in 1934 it fell down. Saruechoo 猿江町 Sarue Cho - "Monkey Inlay"
The Edo estate of the 九鬼家 Kuki family of the 丹波綾部 Tanba Ayabe domain was in Sarue. If someone cuts a matsu 松 pine tree in the forest, he will be cursed by Yamanokami. He will hurt his neck and his nomi 鑿 chisel will not cut any more.
. kadomatsu 門松 gate decoration with pines for New Year . The Zen temple 正福寺 Shofuku-Ji has a Yakushi Do Hall. On the New Year's night, the Yakushi in this hall had to go out to take a pee. He stumbled in the dark and hit his eye on a branch of the pine decoration, thus becoming blind. Now there is never a pine decoration for the New Year at this temple. 橘樹郡宿河原村 In the Tachibana district, Shukugawara village there is an old pine on the top of the mountain. Around 1834 is suddenly withered and all villagers were very sad. In this year, a young man from the next village had used some branches for firewood, but he came down with a high fever. So his family took the remainder of the branches, placed them around the old tree and said prayers and apologies. Soon the young man became well again. At 八幡宮 the Shrine Hachimangu in Shibazaki village in the Tama district there is a Buddha statue said to have been made by 弘法大師 Kobo Daishi. People come here to pray for spiritual achievements. Once upon a time, there was a fire at the Shrine, but the statue had flown away just in time. The temple was reconstructed around 1717. At the pine tree in the compound there was a strange light and when they dug there, they found the statue, safe and secure.